In the past, I have visited Yellowstone at three different times of the year, in July, September, and late October. I have always wanted to come back in the winter, and eventually got around to doing it this February. Part of the reason it had taken me so long are the logistics, which I’ll detail in the next post. The visit didn’t disappoint. I found that visiting Yellowstone in winter is almost like visiting a different park. Because of a continental location far from the oceans and a relatively high elevation, ranging for the most part from 7,000 to 9,000 feet, Yellowstone National Park has some of the longest and coldest winters in the US. From November to May, snow closes all roads in the park to regular traffic, except for the road between the North Entrance (Gardiner) and the North-East entrance (Cook City). However, what is special about the winter season in Yellowstone is that unlike in other parks, the roads, although snowed in, are kept open to specialized tracked vehicles, and some visitor facilities are still operating in the heart of the park. Since the temperature sometimes drops to 40 degrees below zero, what are the rewards of visiting the park in winter ? First of all, there is the beauty, quietness, and solitude of winter. In California, where I live, a few hours after the end of a snowstorm the sun has generally melted the snow on tree branches. 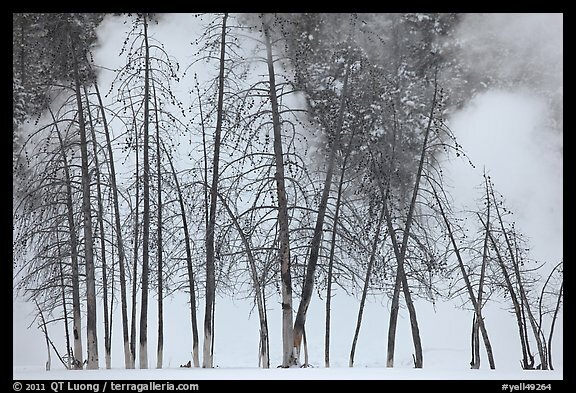 The dry and extremely cold climate of Yellowstone ensures that winter landscapes look pristine and wintry. During summer, up to 30,000 people visit Yellowstone each day, often creating massive traffic jams. The winter visitation is one order of magnitude smaller. 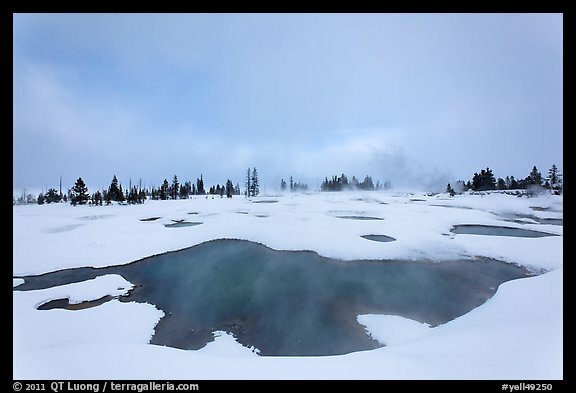 Even in the popular Upper Geyser Basin, you can be alone if you are willing to hike or ski a few miles. The cold weather also enhances the thermal features in a spectacular collision of fire and ice. Every source of warmth produces impressive amounts of steam. The moisture carried by that steam freezes instantly on nearby trees. In the summer, Old Faithful geyser doesn’t look particularly remarkable in between eruptions. In the winter, the steam plume alone can be enough for an interesting photograph. When the geyser actually erupts, the rising cloud can fill the frame of a super-wide angle view. The snow blanketing the landscape makes the vivid color of the hot springs and pools stand out even more. Last, but not least, the cold causes the wildlife (that have not migrated to lower locations) to move into the warmer environments of the thermal basins, where they are more concentrated and more easily approached than during summer. Herds of bison stand in vents, surrounded by steam. After they use their massive heads to push the snow looking for grasses, their faces are snow-covered, making them even more prehistoric-looking (images in next post). During my four-day visit, it was snowing most of the time. The sun never made any real appearance, and except for one night, the sky was almost constantly cloudy. Despite the dull light, there was a special beauty to the landscapes that I tried to capture. However there was simply not enough contrast to highlight geysers, as the steam cloud would blend against the featureless sky. On the evening of the second night, the day ended with snow. However, as I was getting ready to go to bed after dinner, I realized that the clouds had cleared. Although after a full day of hiking, the warm bed appealed, I donned again the cold weather gear, and headed to Old Faithful. An eruption under the full moon awaited me. I would not see any clear sky for the rest of the trip.